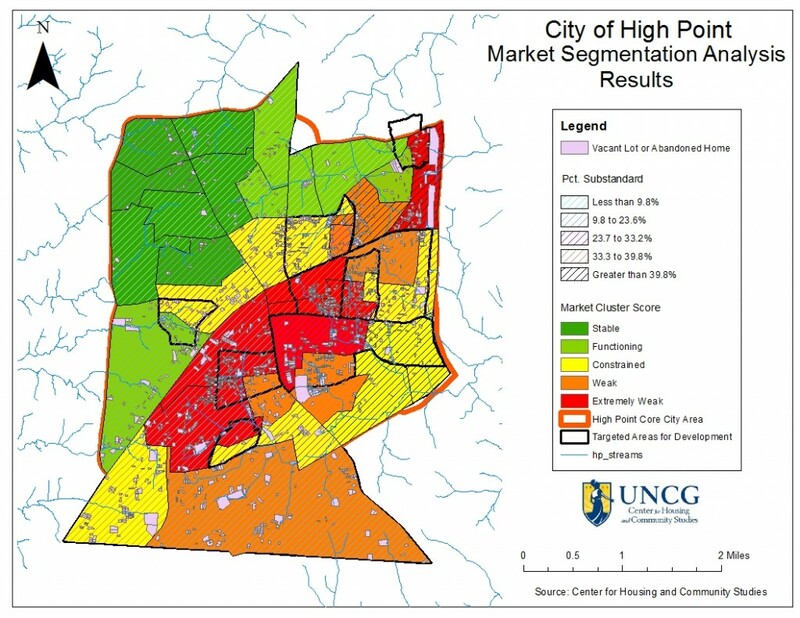 This project was developed to provide data for prioritizing redevelopment and revitalization for the Core City area of the City of High Point, and focused on three interrelated facets of housing in the Core City: the physical state of housing; the socio‐demographic condition of neighborhoods; and the overall opportunity presented by careful market analysis. While existence of vacant and abandoned properties is often indicative of economic distress and disinvestment in a neighborhood, property abandonment is also a cause of disinvestment. This makes it vitally important to target investment and redevelopment efforts in areas with high concentrations of such properties, which present surrounding communities with a variety of problems. CHCS conducted primary data collection in the form of over 15,000 parcel‐level housing stock assessments using Loveland Technologies software for the nine Census Tracts in the Core City area.The remote external assessment tool recorded the number and condition of parcels indicating if they were occupied, vacant, abandoned, and the condition of structures on the properties. This data was matched with current data from the City of High Point (condemned buildings, crime data, public services data, etc. ), and information on community economic, demographic, and social conditions. ArcGIS was used to produce maps showing the Core City overlaid with geospatial data from a variety of National (such as the American Housing Survey) and Local Jurisdictional sources (such as tax records and crime data). Geospatial analysis of the region shows concentrations of poverty which intersect with concentrations of race/ethnic minorities resulting in intergenerational lack of opportunity and little chance of upward social mobility. This data was used to create a geospatial market segmentation index. Market segmentation is a process of analysis that divides an area by natural geographic bounds as well as by demographic, social, economic, political, and cultural divisions. This information allowed for neighborhoods to be ranked as stable markets, functioning markets, constrained markets, weak markets, or extremely weak markets. The study areas in the Core City are some of the most segregated and impoverished neighborhoods in High Point. The largest concentrations of vacant housing units are located roughly along a circular periphery of block groups surrounding the central core city. More than half (59%) of units are renter occupied; neighborhoods with the lowest rates of owner‐occupancy are concentrated in the center of the Core City. Taxes are delinquent on 7.6%.of parcels. Of the total parcels surveyed nearly one‐in-five lots was vacant. In the Core City of High Point, 1,425.42 acres total were vacant; the combined tax value of these vacant lots is currently $99,448,500 (excluding publicly owned and non‐taxed land). Most structures in the Core City were designated as residential (83.4%), followed by commercial (8.4%), industrial (4.7%), and institutional 2.8%. Out of total structures surveyed (n=12,323), 29.1% (3,586) were reported as showing signs of deterioration or damage: 21.7% (2,674) were rated as fair, and 5.2 % (643) were rated as poor.